Forget the shrink! Pet a puppy lick your face! Whoever gets the squeaker out first, wins! An interesting social phenomenon is occurring where people are circulating their favorite quotes on the internet. The image above can be pinned onto a Pinterest board, or circulated via Facebook. 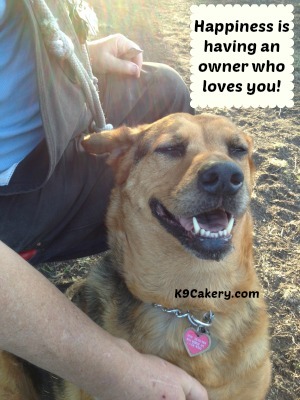 This is good way to connect with your clients and customers who are dog lovers especially if you have a pet business. You do not own a dog, the dog owns you. A piece of grass a day keeps the vet away. A dog is a dog except when facing you. Then he is Mr. Dog. Wag your tail, not your tongue! No such thing as too many chewed tennis balls. Bet I can hold more tennis balls in my mouth. My dog is smarter than your fifth grader. 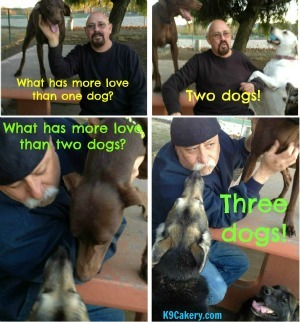 There are dog quote boards springing up all over Pinterest. Join in the fun and start pinning to your own. Start with the image up above. First you will have to sign in at Pinterest and set up a board. Then just click on the little "Pin" icon below the image and it will automatically be placed onto your board. Invite your friends and others to start following you and also invite them to "repin" your images. 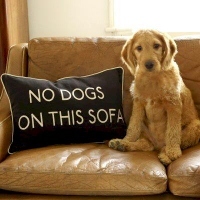 Find popular images featuring dogs and quotes. 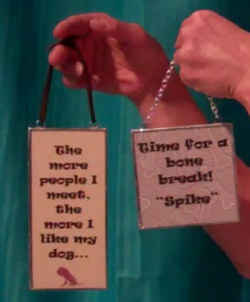 Unique pet owner gifts made using framed dog quotes. Your favorite quote can be turned into a work of art. Jokes and dog stories at least your kids will enjoy LOL!